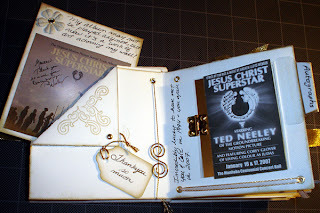 Instead of just making a thank you card to Ted Neeley, I decided to make him a mini-scrapbook album. Inside I wanted to add photos of him with daughter and I, some images from the show, and samples of how he has inspired me and how much he is admired. The book measures 4 inches square. 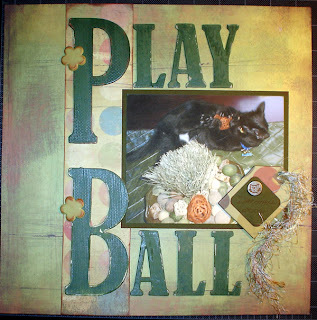 Here is the cover, make from heavy book board covered in a white "suede" paper. 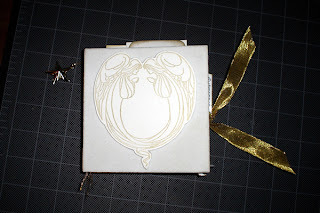 Inside is 12 pages of white Bazzil cardstock, edged in gold ink. 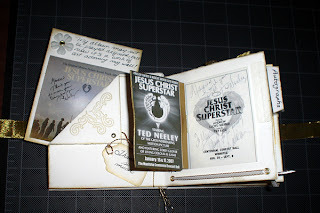 The cover has a gold-stamped image of angels (the Superstar logo) stamped on cardstock, raised on a solid piece of foam and glued in place. 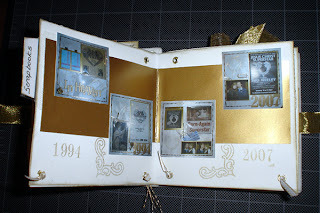 The binding has a gold star dangling from it as well. 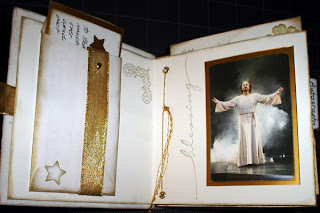 The book is bound with a gold wired ribbon. 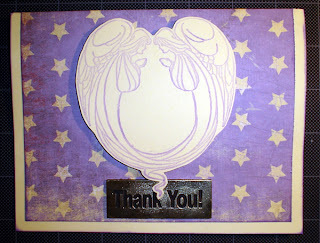 Pages one and two include an inked envelope decorated with ribbon, a brad and star. 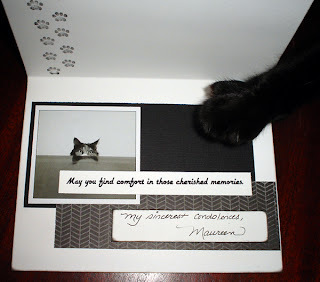 Inside is a personal note backed with gold cardstock. 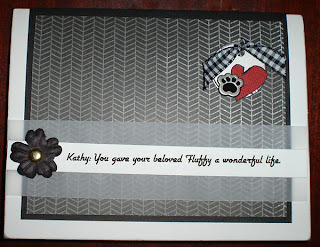 The pages are stamped with fillagree and "blessing" stamps. Gold eyelets are threaded with gold cord as well. The image of Ted is from the current Superstar production. Pages two and three are thank yous for autographs, both from 1994 and 2007. 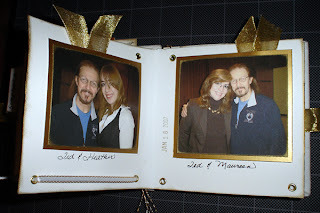 On the left is a photo of my original soundtrack album he signed tucked into a pocket, and on the opposite page, held on with a hinge are copies of the autographed programs he gave us. Upon opening the hinge, the autographed program from 1994 is revealed with both Ted and Carl Anderson's autographs. 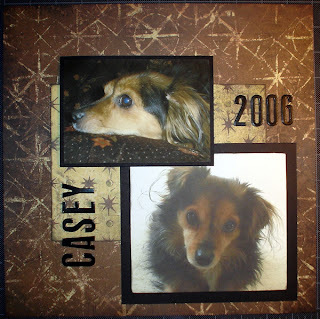 Photos of my coordinated scrapbook layouts (now hanging on my wall) from 1994 and 2007. 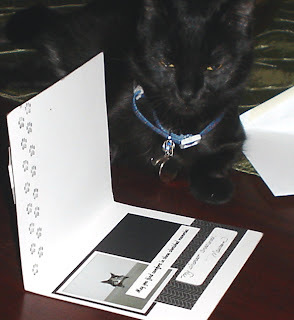 Photos of our meetings with Ted in January of this year. 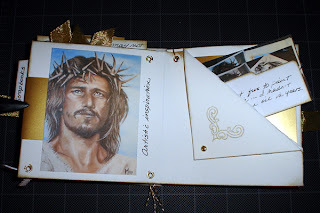 Artwork and a file folder inked with gold with more artwork and a note tucked inside. Last pages. The photo of Ted singing "Gethsemane" (my favorite song in the opera) framed with a photo mount which was covered in a metal sheet. A gold cross, ribbon and brad also decorate it. 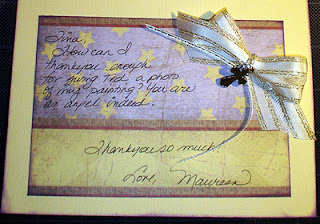 The final page has a personal message to Ted (which I blurred out here for privacy) wrapped with ribbon and the underlying page is stamped with gold fillagree too. 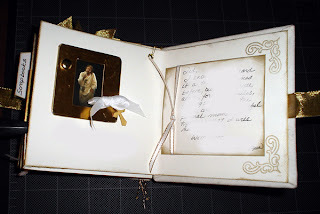 What fun this was... my first mini-book made from scratch. It's now on it's way to him. I hope he likes it!